Q&D’s Specialty Services Group is available to clients and contractors to perform all manner of scopes to help you provide a complete work package. 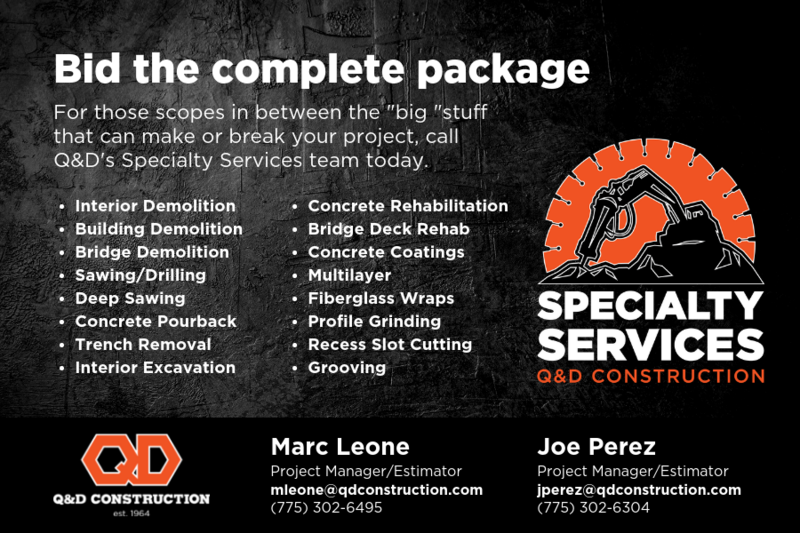 With the resources, record and reliability of Q&D behind them, they offer a full menu of demolition, sawing, concrete patching and pourback, trench demo and more. Demolition service includes full building structures, interiors and bridges. The team provides cutting and sealing services for highways and airports, as well as full depth panel replacement. Concrete rehabilitation includes preparation, repairs, polymer-based pavement services coatings and wraps. The Specialty Services team also offers profile / bump grinding services, recess slot cutting for traffic stripes and pavement grooving. Small projects to round out the menu are epoxy injection, drilling and dock leveler installation. Download a pdf of our services with team contact information.